To all of the many happy and excited kids out there as another school year comes to an end, YIPPIE! Now that summer is upon us, I strongly encourage you to use your extra 'free' time wisely and consider signing up for skating classes! For those of you who don't know how to skate; well, this is the best time to start and learn. For those of you who have already been a part of the Learn-to-Skate (LTS) program and know how to skate, I encourage you to keep up the hard work and use this summer to continue mastering and improving your skills. As you may imagine, the skating rink is the least popular during these warmer months but that's the #1 reason to get to the rink and skate! The LTS program at your local rink runs all year round. 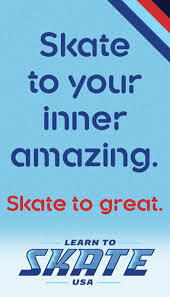 The summer learn-to-skate classes are generally small- I have only three skaters in my current basic skills classes whereas my fall and spring classes average seven to ten skaters and winter classes average over ten skaters. By enrolling in a summer skating program, you will receive much more individualized attention from your coach and also have more ice to practice and less students who will get in your way. Also, skating instructors and coaches are more available and offer more time to teach because many of their current students are on vacation and/or have other summer commitments. Although skating is typically a winter activity, learning to skate in the summer is a great way to stay cool in the sweltering heat and humidity.